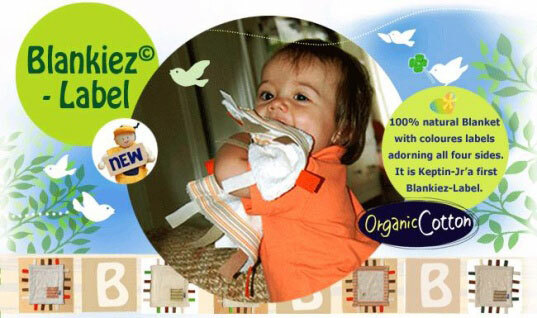 Label Loving Tots Will Adore Blankiez by Keptin-Jr. When my kids were babies, they used to spend more time playing with the boxes their toys came in than they did playing with the actual toys! By the same token, many babies also enjoy the labels on their plush toys just as much, if not more, than they enjoy the toys themselves. With this in mind, Keptin-Jr. created Blankiez, a 100% organic cotton, terry toweling, eco-friendly toy blanket that has multicolored labels around all four edges. If your children are crazy about labels, this soft toy is sure to get their attention! Blankiez is the perfect size for little hands, and features seventeen different labels, which babies can investigate until their heart is content. This soothing blanket, available in Natural, Orange and Lime colors, is made from extremely soft, naturally grown and colored fabrics, and even features a hole to insert a pacifier, making Blankiez the ultimate in comfort and security objects! Moms and dads can rejoice, because Blankiez is also machine washable! If your baby loves soft toys, especially those with tags, the odds are excellent that he’ll love Blankiez. OMG. I wish I had seen those a long time ago. When Cedar was a babe, he was totally obsessed with this one tag on this one blanket. He couldn't fall asleep without rubbing it. Then of course the blanket eventually died, and we had to actually save the tag and sew it to a new blanket because we couldn't find another blanket with such a long tag. Then the tab almost disintegrated - long story short, it was a huge headache. This blanket would have rocked Cedar's baby world for sure.